Despite being part of numerous scandals, Facebook ended the year 2018 on a good note. According to its fourth-quarter earnings report, the company managed to net $16.91 billion in revenue – surpassing its previous record by more than $3 billion. This is certainly an applauding moment for Facebook who managed to defy all critics and analysts who predicted doom for the largest social network after a controversial year surrounding the users privacy, Russian bots, etc. 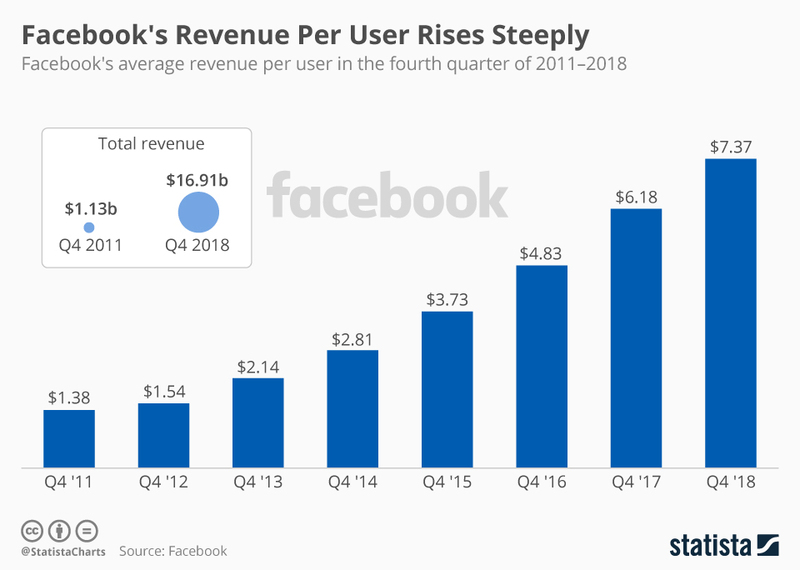 And while the user base for the social media platform is not growing as rapidly as it used to, Facebook does currently boast the title of the world’s largest social network with 2.32 billion monthly active users and 1.52 billion people accessing it every day. The latest increase in revenue signifies that the company generates a good amount of revenue per user. The past quarter report showed the global average revenue per user to be $7.37, which is five times more than the same period in 2011. However, the company’s CFO warned the analysts beforehand that the ad revenue might be slow in 2019 as news feeds of the users are already within limits. Additionally, the focus of Facebook users has shifted gradually towards other areas such as Stories that are not monetized as of yet.